I admit I’m a sucker for red pandas. It’s with great joy, then, that I learned that two baby red pandas were born this summer at Lincoln Children’s Zoo, and they were recently introduced to the public. Only 17 red panda babies were born in captivity this year, and twins are especially rare. In addition, at age 15 the father is the oldest red panda father on record. Unfortunately the babies aren’t currently on display. They may be available for viewing when the zoo opens for a couple days in December. In the mean time, you can see some more photos over at JournalStar.com. The Downtown dining scene is absolutely exploding. On the one hand I wish I still worked Downtown so that I could give all the restaurants a try on a regular basis. On the other hand, the wealth of options would paralyze me every day at noon. ...and those are just off the top of my head! The glut of new food options is fantastic for those of us who love to eat, but it comes with a downside. There’s simply no way all of those places will last for any significant length of time. Not, that is, unless more customers can be brought into the Downtown area. Some of the extra demand will be created by the new Haymarket hotels and next fall’s opening of the Pinnacle Bank Arena. That’s not enough. For long-term sustainability of all of this food, Downtown is going to need more retail, more residents, and more employees. All of that is happening to a certain extent, but the pace will need to pick up a bit. UNL’s goal of topping 30,000 undergraduates would be a big help ... if they were anywhere near actually meeting the goal. The Larson Building helps. 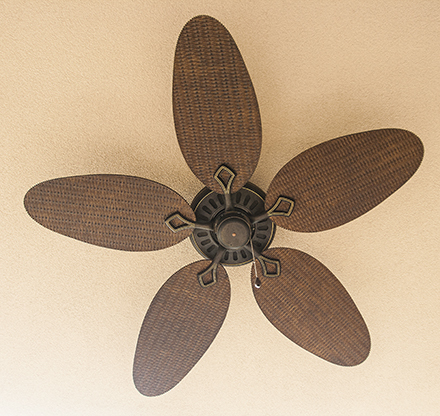 Any residential activity that accompanies the arena will help. Even if I did work Downtown and even once all these new joints are up and running, I know what would happen: I’d still wind up back at Oso, Lazzari’s, and Ali Baba’s. I’m all in favor of trying new and shiny things, but ultimately I’m drawn back to the classics. My impression is that I’m not alone in that regard. And thank goodness. Those mainstays are what make Downtown Downtown. The rest is just filler. I’ve gotta tell you, I really don’t “get” marketing. Just when I think I’m starting to understand it, somebody goes and throws me for a loop. Consider two recent commercials I saw on TV. The first was for Runza. It was yet another commercial in their “the customer is always wrong” line of marketing materials. I’ve ranted about these ads in the past but they still bug me. What Runza is trying to say is something like: “Look, we’ve got our niche and we’re good at it. 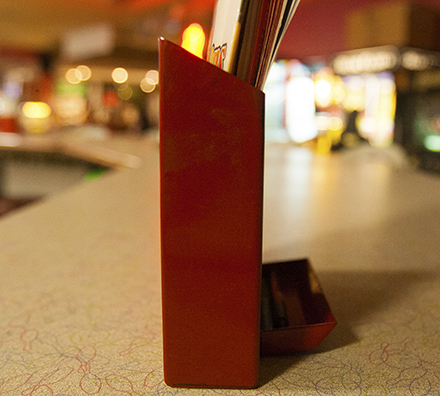 We tried broadening our reach and stirring up our products and it just didn’t work. Remember theOven Stuff’d debacle? We’re going to stick with what we know.” And that would be fine. But their marketing instead comes across, to me at least, as smug and sarcastic. It’s very off-putting. The other commercial was for Amigos. Now we all know that Amigos is about as low as you can get in the local Mexican food scene. Taco John’s is Misty’s in comparison. However, when your food looks like something that would make even a hardened restaurant inspector gag, is it really wise to give it repeated close-ups throughout a TV commercial? Their latest spots for their “cheesy burritos” zoom in on some sort of shiny, orange, semi-solid gunk that the voiceover claims is cheese. I sure hope not. If it’s cheese, it’s cheese that has given up. Eating that stuff would be an act of compassion and mercy, effects on your own health notwithstanding. And don’t get me wrong, I’m no Mexican food snob. I happily lunch at Taco Inn where they assemble your food right before your eyes with all the morose enthusiasm of a circus elephant. Amigos just needs to keep the camera farther from their food if they want to trick me into getting in the mood to eat there. 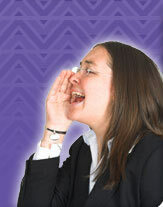 On a barely related note, what is this woman on the Amigos website yelling about? Apparently there’s a rumor going around that Twin Peaks is planning a restaurant in the Haymarket. Twin Peaks is a “man food” restaurant that promises “Eats, Drinks, and Scenic Views”. And by scenic views they mean cleavage. The Haymarket seems like an odd location choice for them. When you look at their existing restaurants, none of them look like they would fit in to a historical district like the Haymarket. For that matter they don’t look like they’d fit in anywhere Downtown. There’s much more of a 27th and Yankee Hill vibe. On the other hand, you know a place like that would do well with the college (and college sports fan) crowd. I guess we’ll just have to file this one under “wait and see”. Finally had an opportunity over the weekend to hit the new Banhwich Café on North 27th. The Café just opened at the new Saigon Plaza in late August. It offers two mainstays – banh mi and bubble tea. 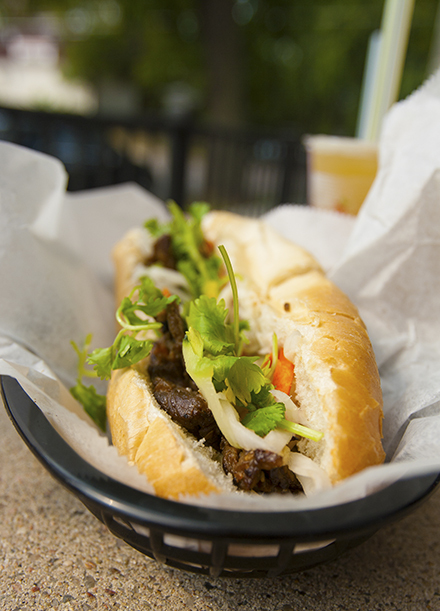 We are fans of good banh mi around here, and miss the old Ba Lee in downtown. What’s not to love about that unique mix of hot and cool, garden freshness and rich flavors on a freshly baked French roll? Though there are still plenty of other places in Lincoln one can find Vietnamese sandwiches, a new venue that obviously specializes in banh mi should get some people excited. At the banhwich café, they offer 5 types of sandwiches: beef ribeye ($4.50 – and pictured above), Thai cilantro shredded chicken ($3.75), grilled pork ($3.95), cold cut ham ($3.95), and Korean-marinated ribeye ($4.50). I had the ribeye sandwich and was very pleased. For one thing, the french roll itself was absolutely fresh, light, and perfectly textured. That to me is one of the key, fundamental requirements of a good banh mi, and I was not disappointed. Likewise, the fresh cilantro, pickled veggies and mayo were all top quality and crunchy fresh without a hint of sogginess. The beef was tender and nicely cooked, and quite mild. I would say that the relative proportions of the ingredients were spot on. The sandwich was certainly not heavy, nor was it too light. It was the perfect combination of size, flavor and freshness. Where I was surprised however was at the relatively high price. Banh mi is typically well under $4 in most restaurants. Most places out west have banh mi at $3 a sandwich and sometimes $2.50 or even $2. If I recall the old Ba Lee here in downtown Lincoln was even selling many of their sandwiches at $2.75. So the Banhwich Café’s prices are higher in comparison. I liked my sandwich a lot, but whether or not others decide they justify the premium prices is a subjective call. For me, the jury is still out. I’ll have to go back again in another week or so and try it again. The Café also has bubble tea at $3.75 in a variety of flavors, including avocado, mango, jack fruit, strawberry, banana, lychee, pineapple, watermelon, kiwi, and papaya. I’m not normally a big fan of sweetened tea or sweet drinks in general, but I tried the strawberry bubble tea and found it to be pretty good, with a healthy dose of tapioca balls in them. 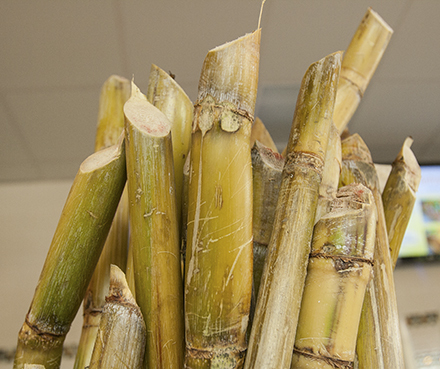 In addition to the bubble tea, Banhwich Café also offers fresh sugar cane juice in small ($3) and large sizes ($5). They even had fresh sugar cane on display on the front counter (above). If you’ve never tried sugar cane juice before, it’s definitely worth a shot. The taste is hard to explain, but it has a very sweet taste (obviously) and a very slight sort of grassy, almost caramel-like hint to it. It’s a great summer time drink. Although again, I’m not a big fan of sweet drinks and not the best judge of sugar cane. Ms. T however is a sugar cane juice connoisseur and ordered a small cup (above), and said that it was very good, albeit with a more processed taste than what she normally prefers. One thing I should mention is that the Banhwich Café is definitely more of a take-away place than an eat-in establishment. There are a few tables and chairs outside of the Café itself, but no seating inside other than a bench to wait for take-away orders. However, when we were there it seemed as if there was plenty of take-away action going on. In anycase, good luck to the owners and staff of the Banhwich Café! Overall, I have very good positive impressions of this new establishment, and I know I’ll definitely be back. Could dinner and a show be in the Lincoln Community Playhouse‘s future? It’s possible if the City Council approves a zoning change on 3.5 acres just south and east of the Playhouse. Although that scenario is possible, I suspect the more likely case is that the Playhouse will some day soon have a new office building or daycare next door. The location isn’t particularly visible nor highly trafficked, so it would be surprising for a restaurant to want to locate there. On the other hand it’s a fine spot for general office use. Even some sort of retirement facility could fit in nicely, particularly with Gere Library and Holmes Lake nearby. The down side of all this is that it means the Lincoln Community Playhouse has given up on its plans to build a new facility. Instead, they’ll use the proceeds from selling this land for improvements to the existing building. That’s something, I suppose. This all reminds me: I should really take my kids to a show. I haven’t been to the Playhouse in ages. On Saturday night I heard that the College View Dairy Queen is closing “soon”. Actually I think the person said “soon, I guess”, with nary a bit of certainty. The store’s (eventual) closing was cited as the reason for their lack of certain ingredients. Apparently they aren’t restocking items after they run out, instead letting supplies dwindle until the only food available is whatever’s way in the back of the freezer. It was suggested that although the present DQ location is closing, it will likely reopen—perhaps as a Grill & Chill—somewhere else in that part of the city. I’m not sure what DQ’s siting requirements are, but I can think of two good spots not far away. The first and most obvious is 48th and Van Dorn where CVS is putting in a new store while tearing down the rest of the existing strip. A modern DQ would do well with Lincoln Southeast just a half mile away. A somewhat less likely possibility is Edgewood where, again, CVS is tearing down an existing building.to put in a fresh store. My pie-in-the-sky dream is that DQ and the neighboring daVinci’s team up to merge the two properties. They’ll both tear down their buildings and construct something new and neighborhood-consistent spanning the two lots, with the parking lot in the rear. I picture a three-story mixed use building of some sort. That’ll never happen, but a guy can hope. Assuming the store’s closing is true, this is a pretty big blow for College View. That DQ is a big part of summer evenings in the neighborhood. Not only will DQ’s absence harm that, but I can’t imagine too many businesses are flocking to move into the ugly and dated building with its iffy parking lot. If this were three years ago I’d guess that d’Leon’s would move in in a heartbeat, but they appear to have slowed their expansion lately. Public Safety Director Tom Casady wants LPD to get out of the water violation enforcement business, and for good reason. Lincoln police officers have contacted over 1,350 offenders this summer. That’s a whole lot of time and energy that could have been spent on far more productive public safety pursuits. At the same time, watering violations aren’t unimportant. We are in a severe drought after all, and we can’t just brush aside individual water violations because they feel, on their own, insignificant. So how do we stop offenders while allowing LPD to focus on bigger issues? Casady wants Lincoln Water System to integrate any fines or penalties into the property owner’s water bill. I have a couple ideas of my own, and Casady’s idea pairs nicely with one of them. I’ll put my ideas out there for you folks to rip to shreds. First, watering violations would no longer be criminal acts. Instead they would be redefined as violations of the user agreement with Lincoln Water System. LWS, then, would be the enforcement body. How would they find out about violations? Simple: any time a water restriction is imminent they would train and “deputize” a group of people—probably volunteers—to identify offenders. Once the water restrictions go into effect the volunteers would fan out across the city and, based on tips to a hotline and website, identify “wet bandits”. They snap some photos or a few seconds of video to document the evidence, put a “you were naughty” notice on the door, and that’s that. Penalties are then assessed to the owner’s water bill. An alternate idea of mine—and one that would be much trickier to put together—involves charging exorbitant rates for “excessive” water use during periods of water restrictions. How is “excessive” determined? Each property would have a set water allowance determined by an algorithm that considers factors like number of residents and area covered by vegetation. Water rates within that allowance are low. Once the allowance is exceeded, however, rates quickly jump to higher and higher levels. The idea is that you can have that beautiful green lawn in the middle of a drought, but you’re going to pay handsomely for it. Those are my two ideas. What’ve you got? If any of you plumbers out there want a last-minute job for this weekend, I’ve got some relatively easy cash for you. Our bathroom needs a shower installed (currently there’s just a tub), and we want to put in a new tub and shower surround. It could be done any time, of course, but I’m in the mood to get it done this weekend (Friday, Saturday, Sunday). I don’t need you to have every possible credential, but I do need you to give me some confidence that you won’t burn down or flood my house. I’m perfectly capable of that on my own, thankyouverymuch. If you’re interested, drop me a note at brent at lincolnite (plus the rest). The Foster CARE Closet is EXPANDING our services. Starting October 1 the FCC will open an Intake CARE Center. Now when a child is removed from their environment to be placed into another home they will make the FCC their FIRST stop. Instead of sitting at case managers desks or in Police cars while placement is being made, they will now come directly to the FCC Intake CARE Center. There we will have the honor and privilege to welcome them into a caring, clean and child friendly environment. We will be able to offer food when they are in need of a meal and because the Department and the FCC are partnering together for this outreach, we will be able to send a child to their placement with up to 5 NEW outfits. It gives area children a significantly more gentle and comfortable introduction to the world of foster care than what they’ve previously experienced. The Foster Care Closet needs help to make this happen. For starters, they’re going to need about $5,000 for materials, labor, furnishings and so forth. You can donate online at any time. They’re also looking for some other donations and assistance, described here. The Foster Care Closet is a fantastic organization. They were there to support our family as we got into foster care, and we’ve happily given back to them on several occasions. This new expansion of their services will benefit area foster kids in real, visible, and significant ways—ways that ultimately benefit the entire community. This is great news for the Closet and for child welfare in Nebraska. Add another few hundred grand to the total spent in studying the area around 33rd and Cornhusker. The Railroad Transportation Safety District has approved another $200,000 for a follow-up study to an earlier study that was widely panned for being far outside the RTSD’s purview. The study is anticipated to cost much more than that before it’s finished. I don’t have a lot of experience with the area around 33rd and Cornhusker, but it doesn’t take many trips through the neighborhood to recognize the potential for trouble. The intersections are awkward; there’s lots of traffic; and there are around 50 trains per day going through the area. If safety and traffic flow are your goals, then clearly something has to change. Unfortunately, the problems being studied around 33rd and Cornhusker are just a small subset of a much larger problem. Nearly the entirety of Cornhusker Highway is a disaster. If I were king and I had a bottomless budget I’d bulldoze Cornhusker plus a block or two on either side of it, and I’d start fresh. If only. Perhaps those of you with familiarity of the 33rd and Cornhusker area have some suggestions for what can be done. Or maybe somebody out there can just look at a map of the existing area and figure something out. Heck, if you come up with a fantastic plan, maybe the RTSD will pay you the $200K they’ve allotted. Yeah it’s probably a bit early. But I’m a cool weather guy and this summer’s heat has really bummed me out. I want to think about snow. Specifically, I’ve been thinking about how I think this winter is going to go, weather-wise. I like to make weather predictions to see how well I do against the likes of, say, the Farmer’s Almanac. I figure I stand just as good a chance at getting this stuff right as they do. I predict temperatures will be average overall. I do think we’re overdue for a wicked cold spell (-10F or so) so I’ll throw one of those in. But overall temperatures will be around the center of the bell curve. As for precipitation, I predict one whopper of a snowstorm accompanied by a bunch of mediocre small accumulations (1-3”). You know what we really need? A vicious ice storm. Boy, I remember a couple from back in my paperboy days that were just incredible. I remember bowling papers at the end of the driveway, watching them slide all the way up the driveway and along the front walk, and hearing the satisfying thwack as they struck the front door. But that’s more of a bit of reminiscing than an actual prediction. What do you foresee, oh Lincolnite prognosticators? What’s in store for us this winter?